Yesterday I finally paid a visit – by car – to the former Big W on Portrack Lane in Stockton-on-Tees, having twice failed to find a way of getting there by bus from Stockton High Street. 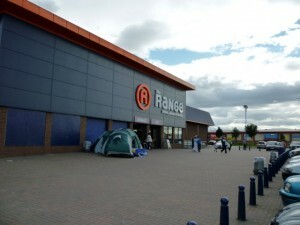 Since April this year, the premises have housed a branch of the home, leisure and garden retailer The Range. Of the 33 North East Woolworths stores that closed following the company’s collapse, this is the 32nd one that I’ve visited and photographed. Something tells me a trip to Berwick-upon-Tweed will be engineered before the summer’s out. 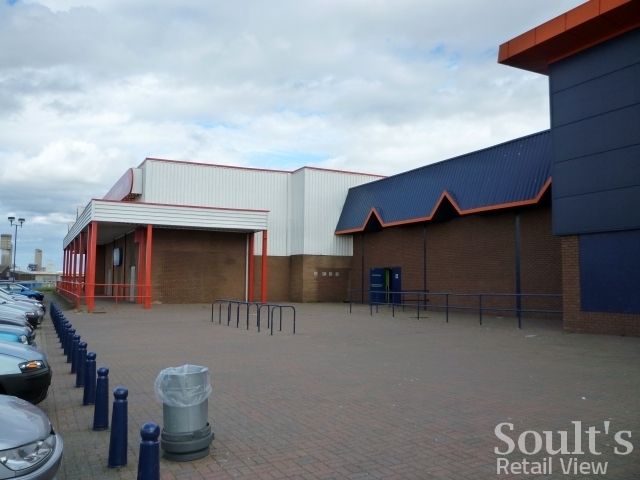 In the 1980s and 90s, Dickens expanded beyond its Portrack Lane site to become a familiar site across the North East, opening stores at Shiremoor, Washington, Scotswood and Darlington. However, Dickens’ store estate proved highly attractive to its expanding competitors, and the retailer was bought out by B&Q in April 1999. The newer sites were all intended to be converted to the B&Q fascia (though Shiremoor was, I believe, later sold on to Boundary Mill Stores instead) but the presence of an existing B&Q Warehouse nearby meant that the Stockton site was surplus to requirements. 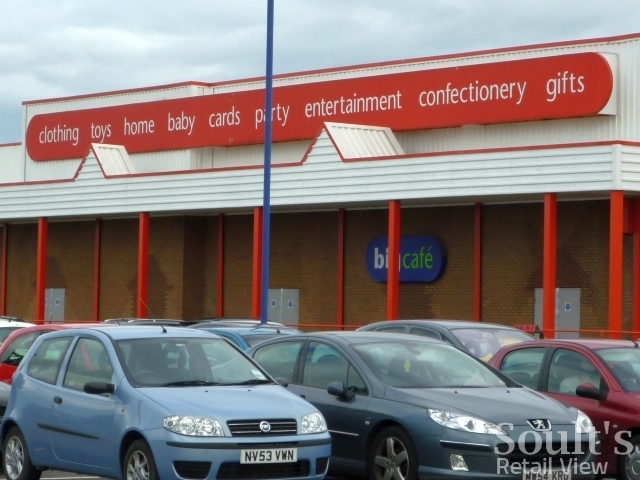 In those days, however, B&Q was owned by Kingfisher – the retail conglomerate that also included Woolworths, Comet and Superdrug – making the Stockton site an ideal location for one of the first wave of Big W superstores. The 100,000 sq ft Big W store opened in October 2000; by 2004, however – as I blogged about previously – the Big W concept had already been scrapped. Just as the Tamworth Big W store was split in two, others in the 21-strong chain were also earmarked for downsizing. Between 2004 and its eventual closure on 30 December 2008, I’m not entirely clear whether part of the Stockton Big W was simply closed off, or whether the full floorspace continued to be used. Certainly, by the time it closed, the store was trading as Woolworths, and featured various concessions such as Peacocks. I’m sure there will be a Soult’s Retail View reader who can fill in the gaps for us. Whatever the score was with Woolies, The Range apparently occupies 60,000 sq ft, meaning that there must be 40,000 sq ft going spare somewhere. Certainly, it’s clear from the outside of the property that not all of it is in use. The Range has reclad the section that it occupies, replacing Woolies’ white and red appearance with its own blue and orange scheme. However, the apparently unoccupied section remains untouched, as can be seen in the shot below. Get a little closer, and you can see that an old roof-mounted Woolworths (or Big W?) 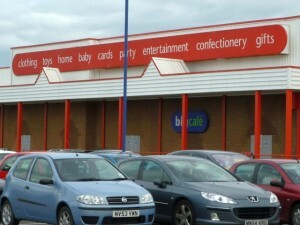 sign remains in place, highlighting the store’s ranges – clothes, toys, home, baby, cards, party, entertainment, confectionery and gifts. 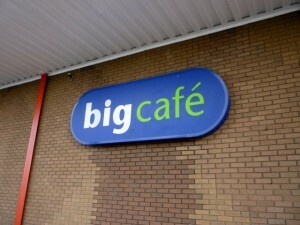 Underneath, there’s also still a sign for the long-gone ‘Big Cafe’. However, my visit was not intended to be just a Woolies nostalgia trip – I was also curious to visit The Range for the first time, given that the Stockton store is the chain’s first in the North East. 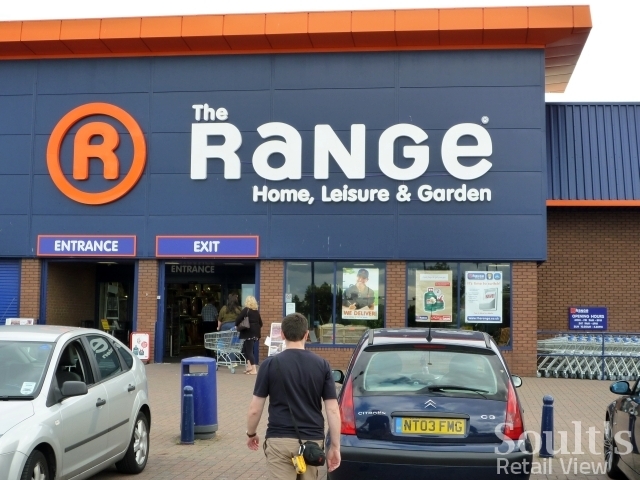 On this blog, you may recall that my only previous mention of The Range was two months ago, when the chain’s owner, Chris Dawson, was reportedly interested in buying up some of the stores and stock of the collapsed Vergo Retail empire. For whatever reason, nothing came of that in the end, and all the Vergo stores apart from Robbs in Hexham, which was bought by Beales, were subsequently closed. Even without that transaction, however, The Range has been expanding aggressively in the last eighteen months, with 45 stores now compared to the 33 that it had in February last year. My first impression on entering the Stockton store was quite how massive it was. It may be only a portion of the old Big W, but it’s still plenty of space to accommodate quite extensive ranges across many categories, with crafts, gardening, stationery, homewares, furniture, DIY, pet supplies, toys and camping among the various departments featured. I was also quite impressed by the quality of the store environment and merchandising, with everything much smarter and better organised than I’d perhaps expected. Recalling a visit to the Tamworth Big W not long after it opened, you might say that The Range is, in many ways, Big W’s obvious successor – stocking similar categories but arguably making a better job of filling the vast space and making it work. Visiting an hour before closing time on Saturday, The Range seemed to be doing decent business, with plenty of cars in the car park and people laden with purchases in the store itself. Assuming that the Stockton branch is a success, it’s hard to imagine that more North East branches of The Range won’t follow, though there must be relatively few existing units that are of sufficient size. Who knows, perhaps The Range could consider taking over all or part of the 120,000 sq ft former ILVA and Marks & Spencer Lifestore site in Gateshead, which has sat empty for the last two years? After housing two ill-fated furniture and homewares stores – that were both beautiful, but ultimately too expensive – The Range could be the more populist retailer that is needed to finally make that unit work. It’s unusual for TK Maxx to close a store, and I didn’t know about the Hartlepool site (shut in January last year, by the looks of it). There’s coverage at http://www.hartlepoolmail.co.uk/news/TK-Maxx-set-to-axe.4855246.jp for anyone who’s interested. 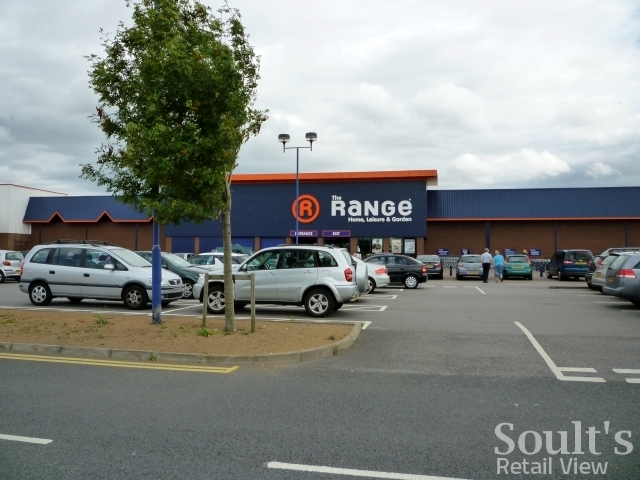 The interior of The Range at Stockton was fine actually – it didn’t feel overbearing or unpleasant, perhaps because there’s so much stock and colour on the shopfloor. Just to run through a few of the points you raised. I can’t recall the store ever downsizing between 2004 and 2008. Although I seem to remember a fair chunk of the building was for stock and obviously not for the public. 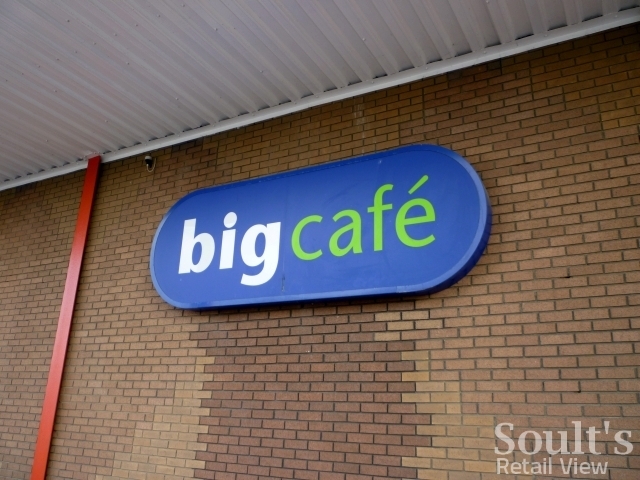 The ‘Big Cafe’ sign was definitely a remnant of the Big W days but that other sign looks like a Woolies one. I’d be interested to see what they’ve done inside, I have no problems with these ‘aircraft hanger’ type stores but the scale of the old Big W one mean it was an odd, and unappealing, shopping experience. On future locations, the former Byker Woolies was what first sprung to mind for me, I think the former M&S at the Metrocentre is just too out of the way. Others I can imagine are the former TK Maxx at Hartlepool Marina and the former MFI unit at Sunderland’s Hylton Retail Park.